We are lucky enough to have a series of guest blog posts from Laurie Charnigo, a Reference Librarian at the Houston Cole Library at Jacksonville State University. 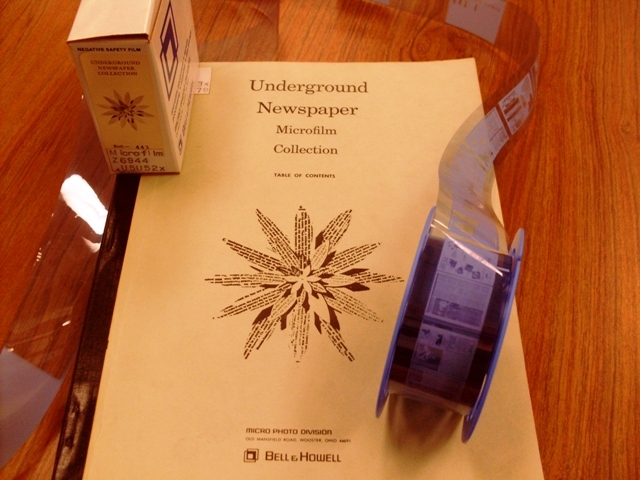 One of the gems of their collection is the Underground Press Syndicate (UPS) Underground Newspaper Collection– more than 500 underground newspapers and newsletters from the 1960’s now preserved on microfilm. Enjoy the first of four posts from Laurie about the collection. …we had been so wiped out by our visions of love and universal truth that we were blinded to the real nature of the death culture and we just couldn’t believe it when Babylon refused to melt away in the face of the colossal wave of good feeling we had let loose on Amerika. …This wasn’t quite what we expected, and it knocked most of us right off our feet, and we still haven’t recovered from the shock of finding out that the world wasn’t going to change just because that was the best thing for it. ~ John Sinclair, “Liberation Music,” June-July 1970. In the introduction to Occupy Wall Street Poetry Anthology, Danny Schechter writes, “All movements need their poets to set the tone, to raise the questions and express the sensibility.” 1 Just as a distinctive literature may emerge from Occupy Wall Street (OWS), the protest movement of the Vietnam era had its own literature in the form of hundreds of underground newspapers published during the sixties and early seventies. Luckily, most of these papers were preserved in the UPS Underground Newspaper Collection. Unfortunately, this collection sits in over 100 libraries throughout the United States gathering cobwebs in moldy, yellowing boxes of microfilm, largely overlooked and forgotten by scholars and unknown by students today. Now, more than ever, it’s time for this collection to be rediscovered and brought back to life. The voices of dissidence, captured in the sixties counterculture papers, in many ways, parallels and echoes the concerns of OWS. 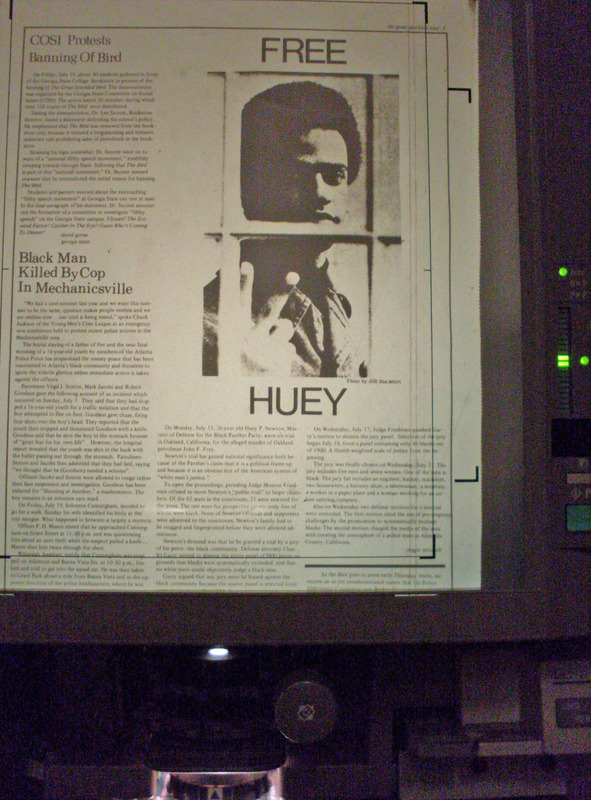 The counterculture newspapers in the UPS Underground Newspaper Collection, published mostly on shoestring budgets and with small circulations, facilitated the anti-war movement while also documenting its history. In 1966, a loose coalition of editors from five papers, including the East Village Other (New York), Los Angeles Free Press, Berkeley Barb, Fifth Estate (Detroit) and The Paper (Michigan State University) founded the Underground Press Syndicate (UPS). Membership into the UPS increased rapidly over the next six years. For a membership fee of ten dollars, newspapers were required to send all issues of their papers to UPS, in addition to all other members of the Syndicate. In exchange for the small fee and swapping papers, all members were allowed to reprint each other’s work with nothing more than a credit line. The underground press dropped all pretense to objectivity, which many claimed was a myth anyhow. The goal of these papers was to rouse their readers to action, to serve as both spokespieces and active participants in the movement. As John Wilcock, former editor of the East Village Other and Other Scenes, recalls “we underground publishers thought we were making history!” Because the newspapers included information on cultural, social, and political events (e.g., protest gatherings, rock concerts, human be-ins, notices about crimes against the people by the “Establishment”) which were not reported by mainstream news sources, the UPS was essential for the rapid spread of counterculture information in a pre-Internet age. An extremely important member of UPS was Liberation News Service (LNS) founded by Raymond Mungo and Marshall Bloom in 1967. LNS served as a sort of Associated Press or a United Press International service on foreign and political affairs worldwide. LNS had correspondents in places such as Southeast Asia, South America, and throughout the United States. For a fee, LNS sent news bulletin packets to interested underground newspapers. This service allowed newspapers to add international and political news, often not reported by “Establishment” newspapers. LNS enabled small local underground papers, such as the Kudzu in Jackson Mississippi, to enrich their own local news with an international flair. 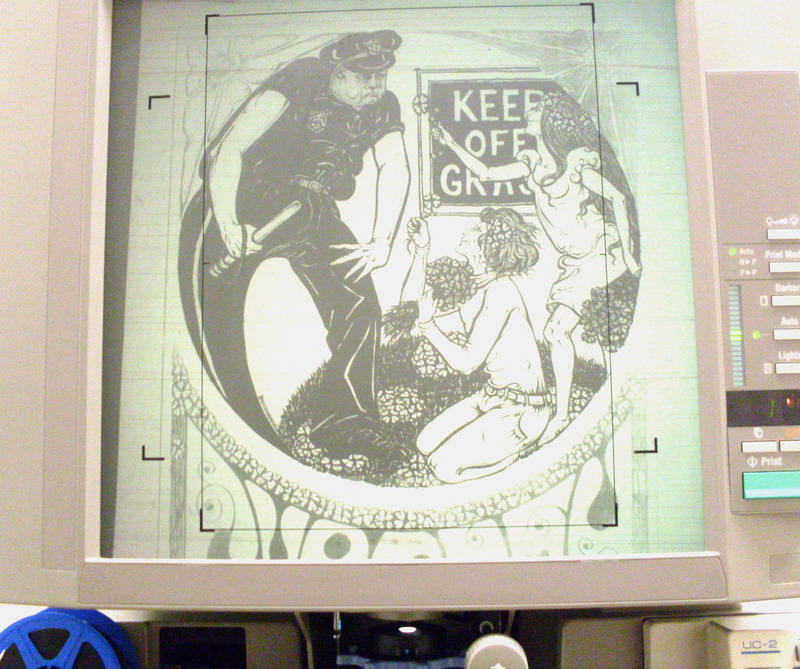 In addition, through membership to the UPS, the Kudzu would have rights to reprint articles written by key members of the counterculture who may have written for some of the larger underground papers, such as the East Village Other or Los Angeles Free Press. The services of both UPS and LNS were essential factors in the rapid growth and expansion of underground newspapers in cities all across the United States. The essay continues: part two, part three, part four.